Heading into Monday's rest day, Le Tour De France 2011 is led by an unlikely Frenchman, Thomas Voekler. I wrote on Saturday morning, as a I sat down to watch stage 14 that I thought we would see an overall contender in yellow by the end of the stage. I meant someone like Contador or a Schleck or even Evans. But then, Voekler wouldn't budge. He matched every contender's attack and made his way up the mini-queen stage as if he belonged. Well... I don't think it is an if anymore. He does belong. Anything to the contrary ignored his grit and fight. I was floored to see it, and if this is the story for the Alps, that the contenders have to rip the jersey off Voekler, man... that is great TV. I'd imagine France is losing its mind rooting for a countryman. Even Armstrong commented, tweeting if Voekler made it up with the contenders, he has to be taken seriously as a threat to win it all. This is something great to behold, and I can't wait to see if he can pull it off. Everyone say a prayer that he isn't pulling a Rassmusin or a Landis. Sunday saw a fun ride, an absurdly brisk pace, and another beautiful example of the madness of the sprint. Having pulled their collective cascaras over the mountain, the sprinters, and Cavendish in particular, put on a show. The frustration of Farrah was palpable through the television afterwards. Sadly for him, and the other sprinters, there isn't another shot to beat the Manx Missile until the grand finish on the Champs-Élysées. 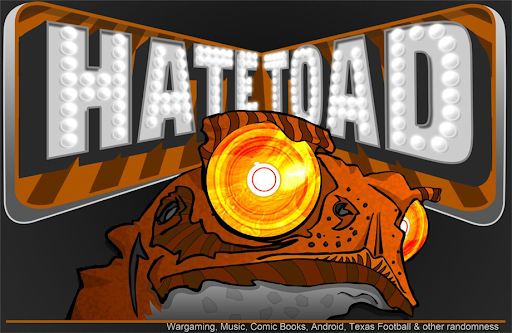 One more thing, on a personal note: This weekend at hatetoad.com marked the 6th straight month of doubling the previous month's traffic. I really appreciate the readership and hope you guys continue to follow after Le Tour finishes and we get back to Wargaming and other such things.